A research team from the ICCUB and the Imperial College London has used data from astronomical surveys rather than cal­culations related to general rela­tivity to measure a standard distance that is central to our understanding of the expansion of the universe. The standard ruler measured in the research is the baryon acoustic oscillation scale. The team calculated the length to be 143 Mpc (nearly 480 million light years) which is similar to accepted predictions for this distance from models based on general relativity [Phys.Rev.Lett. 113, 241302 (2014)]. Illustration of the concept of baryon acoustic oscillations, which are imprinted in the early universe. Credit: Chris Blake and Sam Moorfield and SDSS. This study performed exploratory Lattice QCD calculations of the magnetic moments of light nuclear systems, at the SU(3) flavor symmetric point, corresponding to a pion mass of 800 MeV. When presented in terms of the natural nuclear magneton at the corresponding quark masses, the extracted magnetic moments were seen to be in close agreement with those of nature. Additionally, the magnetic moment of 3He was found to be close to that of the neutron, and that of the triton was close to that of the proton, in agreement with the expectations of the phenomenological shell-model, and therefore suggesting that this model structure is a robust feature of nuclei even away from the physical quark masses. Black hole gamma-ray lightning The Magic telescopes at La Palma have recorded one of the fastest gamma-ray flares seen to date, produced in the vicinity of a super-massive black hole. The result, published in Science [Science, 346, 1080 (1080)], was explained by the Magic Collaboration, which includes ICCUB members, by a mechanism similar to that producing lightning in a storm. On 19 February the ICCUB member Jorge Núñez was appointed director of the Fabra Observatory in Barcelona by the Reial Acadèmia de Ciències i Arts de Barcelona, suceeding Dr. Josep Maria Codina Vidal, who had been the director since 1970. DAPCOM Data Services, a spin-off company of the ICCUB and UPC, was selected in October 2014 to joint the ESA Business Incubation Centre of Barcelona due to the potential of its space technology FAPEC to be transferred from space sector to terrestrial applications. This will allow DAPCOM to enhance and boost its R&D activities on data compression techniques, which will reinforce the company as a reference in data compression technologies and techniques. CENSAT (Centre for Satellite Applications and Technologies) is a new centre of analysis, technological design and development of microsatellite scientific and commercial applications, promoted by the Barcelona City Council and supported by the UB, the UPC, the University of Florida and the ICGC. ICCUB will be the centre most involved in the initiative. It will collaborate in issues such as the development of mathematic algorithms for microsatellite formation flying, the electronic design of sensors, big data processing, data analysis algorithms, etc. The ICCUB was involved in a recent work of the NPLQCD collaboration [Phys. Rev. Lett. 113, 252001 (2014)], published in December 2014, that demonstrates for the first time that Quantum Chromodynamics (QCD) can be used to calculate the structure of nuclei from first principles. The results of the lattice QCD calculation at a pion mass of mπ~806 MeV, in units of natural nuclear magnetons (e/2MNlatt) are shown as the solid bands. The red dashed lines show the experimentally measured values at the physical quark masses. ICCUB researchers have presented the final report, performed under contract with Gencat, in the area of Barcelona and Tarragona. The areas around Port de Beseit have been identified as a potential starlight place. spectra and 2.5 billion high-resolution spectra. More than ever collected from ground or space. The inspection of raw and pre-processed data confirms that the Initial Data Treatment (IDT) module, one of the critical items developed by ICCUB researchers, performs over the expectations. IDT is responsible for the ingestion and preprocessing of the 50 GB of daily data. The models for the photometric data reduction developed by ICCUB researchers have also demonstrated to be well performing. ICCUB researchers are leading the building of the final catalogue, which will contain not only the data themselves, but also tools for their optimal use. Although the final archive will only be available around 2-3 years after the end of the mission (around 2022-2023), early releases are foreseen. The first one is scheduled for summer 2016. Therefore, the scientific community will soon be able to use the rich datasets from Gaia and generate profound advances in the study of the Cosmos. Gaia's on-board detection algorithms registered more than 84,000 detections in the Cat's Eye Nebula Left: HST image of the Cat's Eye nebula (the image is ~1 by ~1 arcminute). Middle: the ~84,000 Gaia detections that were made in this area from 25 July to 21 August 2014. Right: a superposition of the two images, showing that Gaia is actually able to detect not only stars but also high surface brightness filamentary structures. The Large Hadron Collider is scheduled to restart for physics early in 2015 after two years of maintenance and upgrading. The collision energy at restart will be 13 TeV, a significant increase over the initial LHC run. 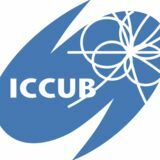 The LCHb experiment, in which ICCUB participates, will be able to collect data of higher energy proton-proton collisions. This will increase by 4 times the detected number of particles containing b quarks, thus allowing us to get more insight into the asymetry between matter and antimatter. The LHCb detector has shown a very successful operation during the first period of LHC running. After restart, the LHC will be capable of delivering higher energy collisions. An LHCb upgrade is planned for 2018 which will allow the detector to exploit higher luminosity running starting in 2020. First observation of two new particles in the LHCb Two new particles, known as the Ξb’- and Ξb*-, are barions made of one beauty (b), one strange (s), and one down (d) quark. The new baryons had been long predicted to exist, but their specific characteristics, such as their mass, were unknown. The ICCUB has contributed to the LHCb upgrade with the design, production and test of a complete analog signal processing channel for the calorimeter, both in commercial on the shelf and ASIC (ICECALV2) versions. A first prototype for the input stage of the PACIFIC ASIC has also been designed for SiPM readout in the new Scintillating Fiber Tracker. The first speaker of the new ICCUB Colloquia series will be the distinguished Spanish physicist Ignacio Cirac, awarded Príncipe de Asturias 2006. The ICCUB Colloquia 2015 will consist on 6 exciting and accessible talks given by world renowned speakers about cuttingedge topics in cosmology, astrophysics and particle physics and will be directed to a diverse audience, including not only ICCUB members but also external researchers and graduate and master students. They will take place on Thursdays at 12:00 at the Aula Magna of the School of Physics, headquarters of the ICCUB, and will be preceded by an informal welcome with coffee and biscuits in which assistants will have the possibility to talk with the speaker. The School of Physics of the UB hosts the exhibition “Physics in our lives”. 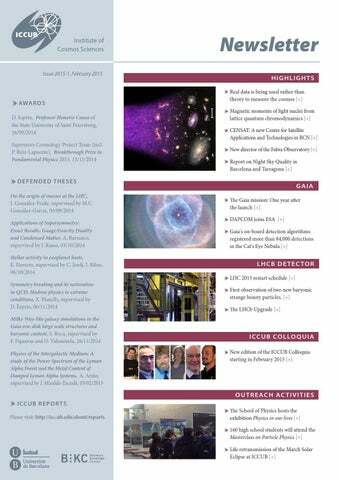 The exhibition, created by National Center for Particle, Astroparticle and Nuclear Physics (CPAN), has been and brought to Barcelona by ICCUB and can be visited until 11 March 2015. The Masterclass, organized by IPPOG at the international level and by ICCUB in Catalonia, will be held the 2 and 9 March at the School of Physics. During each session, participants will be able to analyse data registered by the Large Hadron Collider (LHC) at CERN.